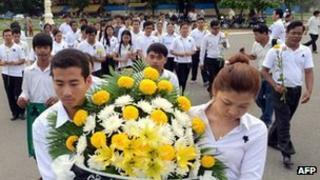 Cambodians are mourning the death of former King Norodom Sihanouk, as officials prepare to return his body from China. Mourners wore black ribbons and flags flew at half-mast in Cambodia following his death in Beijing on Monday. The official mourning period is to last a week, an official said. His body will be cremated in three months. Sihanouk, 89, became king in 1941 and led Cambodia to independence from France in 1953. His son, King Norodom Sihamoni, and Prime Minister Hun Sen flew to China on Monday to accompany his body home. Officials say they are expecting thousands of people to line the streets from the airport to the royal palace when his coffin arrives in the capital, Phnom Penh, on Wednesday. In Phnom Penh, students wearing white shirts with black ribbons pinned on them sang songs before offering flowers at the royal palace. "I miss him. I came here to cry and release my sorrow. Under his reign we lived happily, he never hurt anyone," Sam Sivorn, 58, told Agence-France Presse news agency in the capital. Officials from the US, China, North Korea and Japan, among other countries, also sent messages of condolence. Chinese Premier Wen Jiabao and other officials visited Sihanouk's family in Beijing to express their sympathies, according to a broadcast by state-run CCTV. North Korean leader Kim Jong-un on Monday said that Sihanouk and his late father, Kim Jong-il, had "the most profound" relationship that was "unprecedented in history". Sihanouk had a residence in Pyongyang. The former king had remained an influential figure in his country, despite his abdication in 2004 in favour of his son. He was a presence through decades of political and social turmoil in Cambodia, despite long periods of exile overseas. He emerged in later life as a peacemaker who helped bring stability back to his country, after an ill-fated choice to back the Khmer Rouge in its early years.